I loved the one-use soap idea from back in December. It was a big hit with my friends and family. They loved the little snowflakes and they were nice little gifts to give. And very easy to make. So, I decided to recreate them for Valentines Day, this time in the shape of conversation hearts. 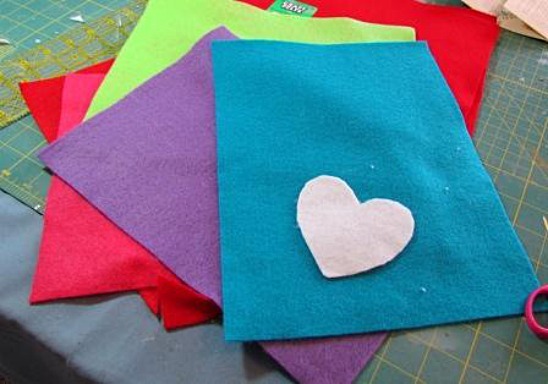 I started by cutting out a heart template from a small piece of white felt (you could use cardboard for the template if you like). 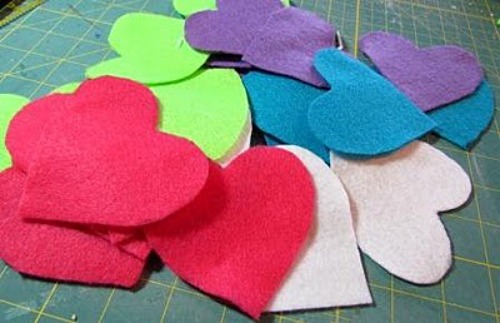 I used that to cut out all the little felt hearts. 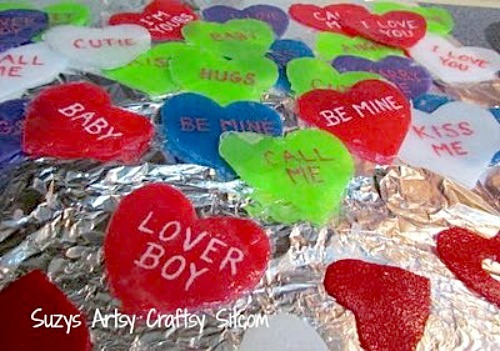 Now using the acrylic paint and a small brush, paint conversation heart sayings on all of your hearts. 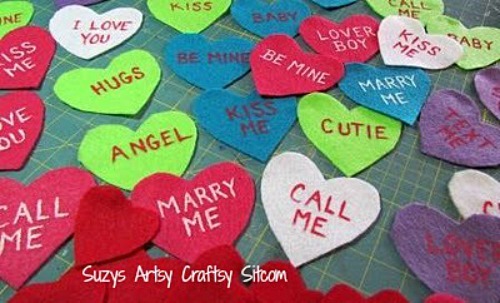 I used sayings such as I Love You, Marry Me, Call Me, Sweet Heart, Cutie, Angel….but really, you could totally personalize these. The acrylic paint needs to dry completely before you go to the next step. Acrylic is only water soluble when it is wet. After the paint dries, you don’t have to worry about it washing off on your hands. Put some chunks of the glycerine soap in a microwave safe bowl. Lay out several sheets of aluminum foil or wax paper for a drying area, and have ready your scent drops and a spoon for stirring. Microwave the soap on high in your microwave for 30 seconds at a time, stirring in between each session, until most of the soap has turned to liquid. The heat from the bowl will melt any small pieces left as you stir it. 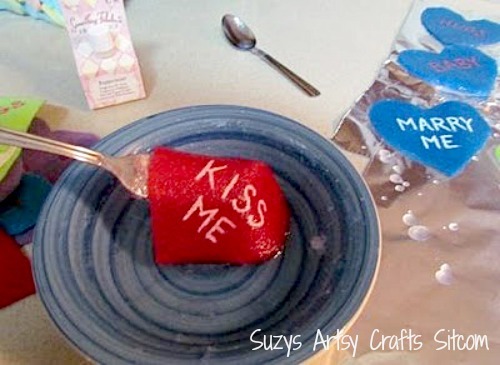 Once it is melted, add a few drops of scent. I used peppermint because I love the smell, but any scent or no scent is fine. 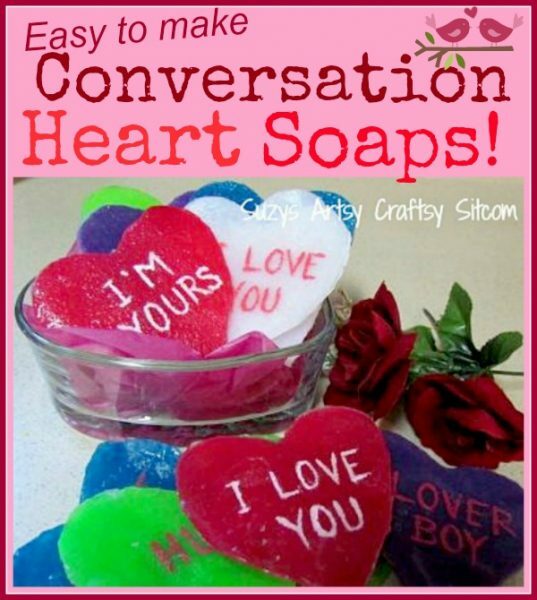 Now place a heart in the bowl, allowing it to soak up the liquid soap and lift it out with a spoon. Drain for a moment and then place it on your aluminum foil to dry. I found that one dip in the soap gives it a slightly textured look to the top due to the texture of the felt. If you want them totally smooth, then redip after they have dried. The second layer will be smooth. Keep in mind that if you decide to do this, they will be multiple-use soaps because there will be plenty there for several hand washings. Not necessarily a bad thing. They take about 5-10 minutes to totally dry. Then peel them off the foil and use a paring knife to trim any excess off the edges. 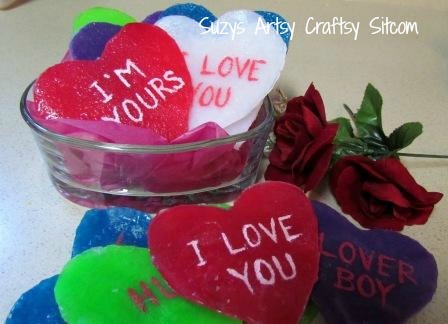 These little soaps can be stored in your purse in a zip lock bag and used as you need them. 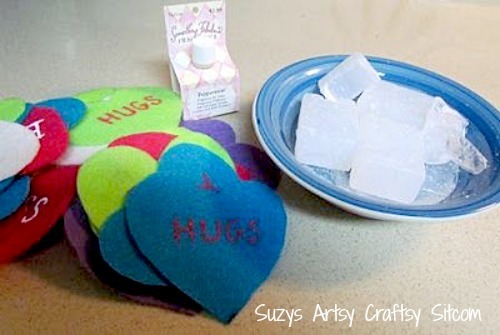 Once the soap is used up, the felt inside can be used as a little heart-shaped wash cloth and then thrown away. And they look very cute in the bathroom. 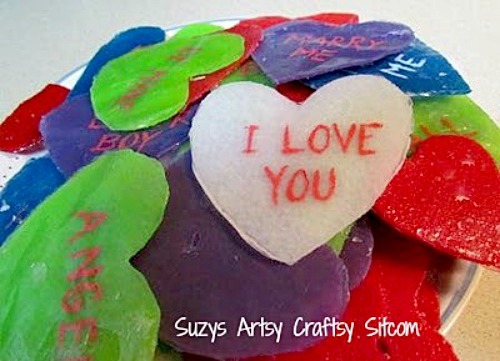 I plan on putting five different colored ones in cellophane bags and presenting them to my friends and relatives on Valentines Day. Shhh…don’t tell! 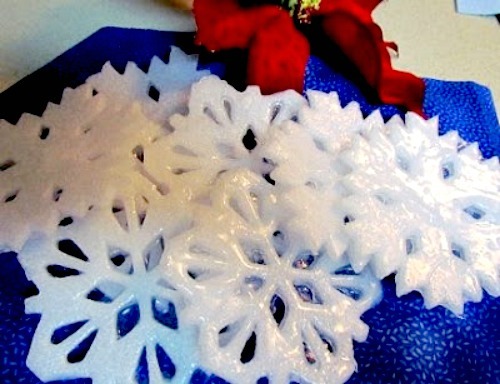 If you enjoyed this tutorial, you might want to check out my Snowflake Soap tutorial. Pretty much the same process only with pre-cut felt snowflakes. 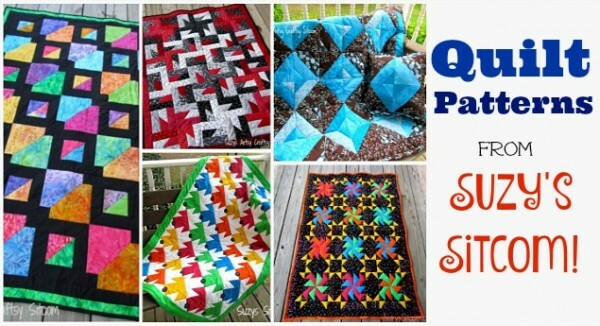 Want to try your hand at quilting? Next post: New Linky Party Page!